In today’s Gospel, the master entrusts to his various servants, different amounts according to their abilities. The servants are expected to manage the money and give the master a return on his investment. Two of the servants invest it and return to the master a one hundred percent gain. The third servant lets fear get the best of him and decides to bury the money. The master praises the first two and criticizes the third. This sounds kind of harsh until we understand what Jesus was saying in this parable. 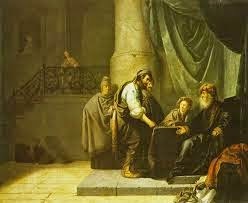 Let’s say the third servant invested the money but lost it all and was not even able to return the initial amount to the master. What would Jesus has said about this servant. Commentaries have talked about just this situation in order to help us better understand the Gospel message. If the third servant had invested his Talents wisely but lost everything the master would have praised him as he did the first two servants. We see this in the lives of the Saints. Those who were martyred for their faith look as if they lost everything. Yet God sees things differently. In this Gospel, God is the master and we are the servants. God gives each of us talents; some are in the form of money, some in the form of skills. He expects us all, not to hide or bury our talents, but to use them bravely, wisely and for His greater glory.